Language is all around us, but it takes more than just casual familiarity with words and letters for children to be able to read. In Montessori, we are blessed with wonderful materials like the sandpaper letters, movable alphabet, and the Pink, Blue, and Green Series. These go a long way towards familiarizing children with letters and sounds. But, it’s sometimes nice to to include some games and activities to encourage a pre-reader or emergent reader. 2. Choose a picture out of a magazine or unfamiliar book and have the child tell you a story about what is happening in it. 3. 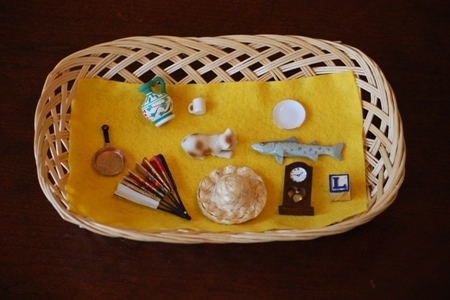 Make a rhyming basket with several small objects that rhyme. Have children match rhyming items, like this one I made for my daughter, by placing them next to one another. The items are, from left to right: pan/fan, jug/mug, cat/hat, fish/dish, and clock/block. 4. Practice forming letters using materials that are fun: pasta noodles, kidney beans, cereal. 5. Have a specific reading time each day. Actually, I like to have two reading times: one for silent reading (you should read quietly too!) and one for you to read aloud to the children. Even a pre-reader or early reader can sit quietly with a book and discover a story through illustrations. 6. Give children games to play with cards and games that reinforce pre-reading skills. Examples might include: opposite matching, rhyming object cards, part-whole matching, sequencing, and patterning. 7. Have a child re-tell their favorite story using props. They can dress up in costumes to act it out or make puppets to help illustrate the plot of the story. 8. Practice drawing letters or numbers by tracing them in a tray of sand, rice, or cornmeal. Shake the tray to “erase” after each letter or number. 9. Staple or tape blank paper together to make a booklet. Ask the child to tell a story by drawing a picture on each page. If they would like, they can dictate the story to you and you can write it in the booklet as well. By trying out some of the ideas above with pre-readers, you’ll not only encourage enthusiastic development of language, but foster a love of learning that will extend well beyond the years spent learning to read. Any ideas for other types of pre-reading activities? I’d love to hear from you!